This Arrowhead Spiketail dragonfly photo was taken at Ody Brook, the property owned by Ranger Steve Mueller. Photo by Jerry Belth. Standing on vegetation in sunlight, an Arrowhead Spiketail allowed us to see its bright yellow arrows that appeared to have been painted on its black abdomen by an artist. The spiketails are large dragonflies and the Arrowhead is striking and beautiful. My colleague Jeff Belth, who wrote the book Butterflies of Indiana, was able to photograph one while we explored Ody Brook (see picture). Dragonflies are active insects pursuing small insects for a meal. The agile flyers are perhaps the best insect flyers and it is difficult to get looks at details. Venture out early in the day and the dragonflies might still be perched and sleeping with dew covered wings. I tend to be a late sleeper so I do not beat the sun up for its morning rise. If you go out when the sun is above the horizon and warming the day, a watchful eye might find various dragonflies perched. My first experience with the Arrowhead Spiketail was in Porcupine Mountains State Park and I was elated to see such a magnificent creature. It is generally difficult to approach this species but I have seen them perching in grassy in fields where I could get a great look with binoculars. Generally, they are a northern species so I did not expect them here. It is wonderful that so many life forms share Ody Brook. The down side is that is difficult to observe everything. I have not given adequate attention to dragonflies and have only documented a few species here. This year we first noticed the unexpected Arrowhead Spiketail at Ody Brook. They have probably been here since I joined this community of nature niches in 1979. For 37 years I have lacked adequate focus on who my neighbors are but we have shared the property in harmony. Many dragonflies are fairly small (1.5 to 2 inches long) but the spiketail is three inches long. Its wings are clear except for a small black stigma near each wing tip. The stigma is a dark thickened wing membrane near the tip appearing as a dark spot. It helps provides weight and flight stability. It is hard to notice body pattern details when dragonflies zip about the yard. Patient observation provides an opportunity to see details when the insect hunter takes a break and lands. When we are lucky, it lands in a field, but in forested areas this species will perch in sunlit tree tops. Dragonflies, like other insects, have three body sections (head, thorax, and abdomen). A long, black abdomen with yellow arrows pointing toward the tail make this one an easily identifiable dragon. The abdomen is long and thin. Between the wing bases is a large thorax with powerful muscles attached to the inside of the exoskeleton. Unlike vertebrates that have an internal skeleton, insects have their skeleton on the outside. Muscles in the thorax pull the two sides of the exoskeleton together in alternation with muscles that pull the top and bottom together. The alternation of contraction and relaxation, in rapid sequence, forces wing movements to create flight. Pay attention to colors and patterns on the thorax that are helpful or essential for identification. 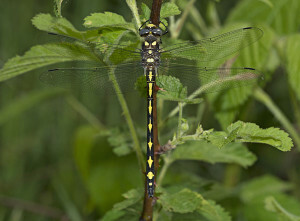 The Arrowhead Spiketail has two yellow thorax stripes. On the head, how the eyes meet with each other is important. All spiketail species have eyes that only touch the other eye in one small spot. Many species of dragonflies have eyes completely separated or touch along their length on top of the head. Associate dragonflies with habitat. Little Cedar Creek at Ody Brook has many spring seeps, with soft bottoms in the west part of the sanctuary, that keep water flowing all year. The creek headwaters in the east portion of the sanctuary dry in summer. The spring seeps with small persistent pools and muddy bottoms covered by shallow water, is where female Arrowheads lay eggs. After eggs hatch, the small aquatic naiads feed on insects in the water before transforming into the gorgeous adults. Look for adults in June and July. Always expect something new.